What says summer better than peach pie? How about alcohol-infused peach pie? 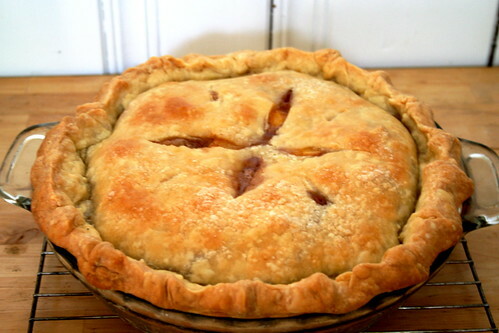 Or sweet agave caramel peach pie? Or, well, because we’re being decadent now, a combination of all of the above? Just before the long weekend, Sassy Radish posted this recipe from Gourmet for Honey Bourbon Peach Pie. I knew I had to make it and I knew I had to make it within the next twenty-four hours. That’s how ridiculous my cravings are. Luckily I had an excuse to make it–the Tour de France cook out my friends Josh & Amy hosted on the 4th of July–and a grocery trip already lined up for the following afternoon. Maneuvering the Dekalb International Farmers Market was a third-world gone-to-market day mess, but I find that kind of thing invigorating so it was definitely all worth it on my end. After procuring the necessary ingredients, I set to work making the pie crust while I seasoned my first cast iron skillet (got it at the thrift store for $8!!). I think the main thing with the crust is to keep the butter fridge cold until you add it to the flour. I used a pastry cutter to keep things simple, but a food processor would obviously do the trick too. I then chilled the dough overnight and assembled the pie the morning of the 4th. Assembly was a cinch. Only blanch the peaches if they aren’t super ripe. Some of mine were, some weren’t. It’s just an unnecessary step if the peaches are ripe and ready to be peeled. Now the original recipe called for honey which I easily subbed agave nectar for. It also called for bourbon which I could have used a bottle of but since I already had a fabulous gifted rye whiskey on hand I figured it couldn’t be too bad. It wasn’t. Since it was caramelized with the agave and sugar I’m not sure that bourbon vs. whiskey would have made that big of a difference. Served with Soy Delicious vanilla ice cream, the pie was a hit. The agave-whiskey caramel really brought out the tartness of the peaches and the crust was flaky-killer-good. I had to hold myself back from seconds. I think it might have even tasted better the next day too. Just something about the flavors having more time to meld and set. I’m definitely thinking about trying out this agave-whiskey combo with other fruits in the near future…maybe in cobbler form? Whisk together flour, sugar, and salt in a bowl (or pulse in a food processor). Blend in Earth with your fingertips or a pastry blender (or pulse with a food processor) just until most of mixture resembles coarse meal with some roughly pea-size butter lumps. Drizzle 1/3 cup ice water over mixture and gently stir with a fork (or pulse) until incorporated. Squeeze a small handful of dough: If it doesn’t hold together, add more ice water 1 Tbsp at a time, stirring (or pulsing) until just incorporated, then test again. Do not overwork dough, or pastry will be tough. If the peaches are not ripe, cut an X in bottom of each peach, then blanch peaches in batches in boiling water 15 seconds. Transfer with a slotted spoon to an ice bath to stop cooking. Peel peaches and cut into 1-inch-thick wedges. If the peaches are ripe, simply peel and slice. Toss peaches well with cornstarch, flour, lemon juice, cinnamon, and salt in a large bowl. Put a foil-lined large baking sheet in lower third of oven and preheat oven to 425°F. Bring 1/2 cup sugar, agave, and bourbon and water to a boil in a 1 1/2- to 2-qt heavy saucepan over medium-high heat, stirring until sugar has dissolved, then wash down any sugar crystals from side of pan with a pastry brush dipped in cold water. Boil without stirring, swirling pan occasionally so caramel colors evenly, until dark amber, about 5 minutes. Remove from heat and add butter, swirling pan until butter is melted. Pour over fruit and toss (caramel may harden slightly but will melt in oven). Roll out 1 piece of dough (keep remaining piece chilled) into a 13-inch round on a lightly floured surface with a lightly floured rolling pin. Fit into a 9-inch pie plate. Trim excess dough, leaving a 1/2-inch overhang. Chill shell while rolling out remaining dough. Transfer filling to pie shell, mounding it. Cover pie with pastry round. Trim with kitchen shears, leaving a 1/2-inch overhang. Press edges together, then crimp decoratively. Brush top all over with some of soy milk, then sprinkle with remaining Tbsp sugar. Cut 3 or 4 steam vents in top crust with a paring knife. Bake pie on hot baking sheet 20 minutes. Reduce oven temperature to 375°F. Continue to bake until crust is golden-brown and filling is bubbling, about 50 minutes more. Cool pie to room temperature, 3 to 4 hours. Oh my, what a pie – blue ribbon-worthy! Beautiful looking pie, and it sounds truly awesome! oh goodness – that looks like a lovely pie!! i love the idea of agave/whiskey. I wound up using bourbon bc that’s all i had in that department – i’m a huge bourbon girl. great find on the iron skillet. love when stuff like that happens. Looks delicious! The name also makes me very happy. It rhymes! this is so fantastic. peaches are finally here! it’s like the one thing i wait for all year, even more than my birthday!! i can’t imagine any better combination than peaches, agave and whiskey! i like your cravings. Sounds so wonderfully comforting! I’ve actually never made a double crust pie (only tarts) with stone fruit, but it sounds really appealing right about now. agave + booze + peaches = hellz yeah! cast iron skillets are the best, Jes! nice job on the thrift score! superw00t! totally finding a gluten-free crust recipe & rock’n this recipe! thanks, Jes!